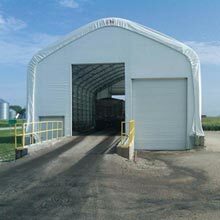 TekSupply offers large garage doors to provide vehicles and equipment with easy access to our buildings and warehouses, including our ClearSpan™ Fabric Structures. From commercial coiling sheet doors to fabric gathering doors, we can offer the ideal solution for any application. What steel garage doors does TekSupply offer? 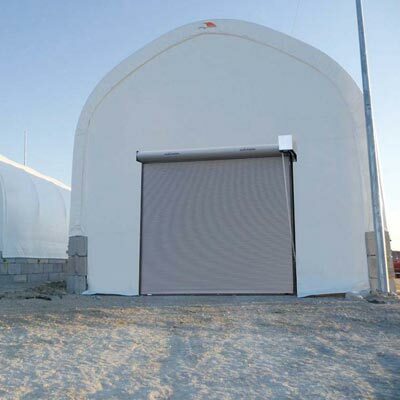 TekSupply offers Raynor® DuraCoil™ Rolling Steel Service Doors for agricultural, manufacturing and commercial storage buildings. 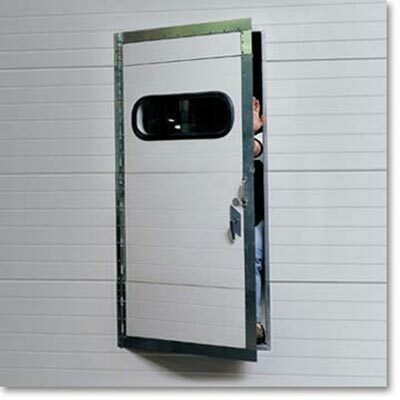 These doors are available from 20' to 35' wide with 24-gauge steel hoods to protect the door when it is rolled up. Raynor doors are available in both Standard and Optima style. 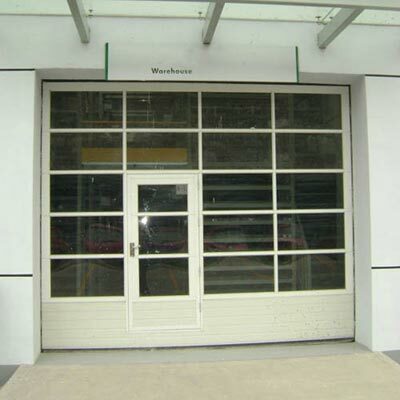 The Standard doors are designed to meet or exceed the requirements of daily use for most applications. The Optima door is ideal for high-security applications and oversized openings. Raynor Thermal Sectional Doors are the most specified sectional doors on the market today. These doors are the industry's benchmark for commercial sectional doors, providing unparalleled reliability and stability to meet or exceed the requirements of daily use. Available from 8'2"W x 8'H to 14'2"W x 14'H, Raynor Thermal Sectional Doors are made of extruded polystyrene insulation thermally bonded between two hot-dipped galvanized, rust-resistant steel skins. Pedestrian doors are included on most sizes and are designed for convenient entry, while minimizing energy loss. 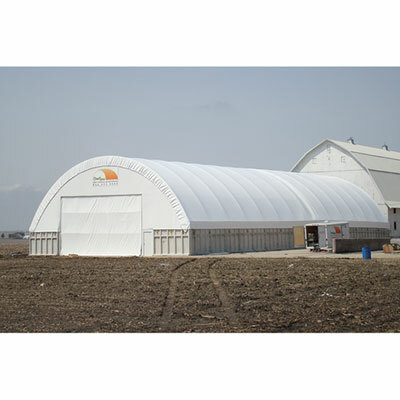 These doors are ideal for ClearSpan™ Fabric Structures, agricultural buildings, high-security applications, large openings, service facilities, thermal environments, transit facilities, truck terminals, warehousing and manufacturing, greenhouses and more. Janus Commercial Coiling Sheet Doors from TekSupply are ideal for a wide range of applications due to their sturdiness and dependability. We offer Janus 2000 Commercial Coiling Sheet Doors for smaller openings and Janus 3652 Commercial Coiling Sheet Doors for larger openings. The 2000 doors are manual push-up doors and are an ideal alternative to sectional or slat doors. The 3652 doors are wind-load rated and tested in accordance with the International Building Code and Florida Building Code (FL 14425), making them ideal for commercial applications. AlumaView™ OPTIMA Sectional Doors can customize a multitude of facilities with the highest standard of dependable, attractive sectional doors available. 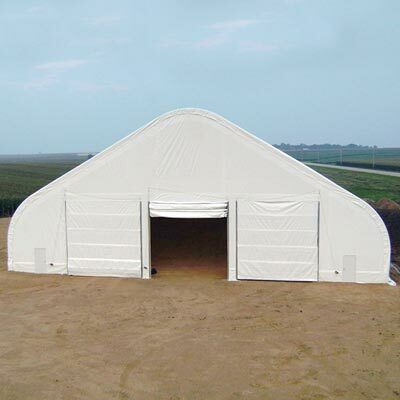 They have been the standard fix for structures that require doors with maximum visibility. AlumaView™ Doors are available from 8'2"W to 12'2"W and include pedestrian doors that are designed for convenient entry, but minimize energy loss. These doors are ideal for greenhouses, showrooms, garages, repair facilities, auto dealerships, service stations, warehouses and more. 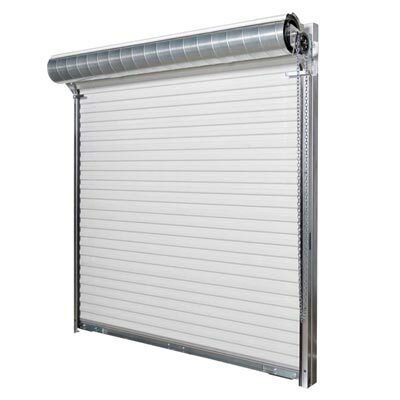 What bi-fold doors does TekSupply offer? 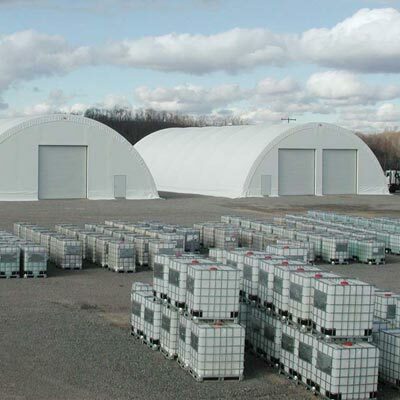 TekSupply offers an extensive line of ClearSpan™ Giant Doors that are an ideal solution for new and existing aviation, industrial and agricultural buildings. These bi-fold doors are designed to withstand high wind speeds and provide large clearances for aircraft, vehicles, equipment and more to meet your needs. Door frames are made of galvanized structural steel and are fast and easy to install, requiring no onsite welding. A heavy-duty electric drive unit with simple up/down controls is included. These doors are designed for any application, with cladding options that include economical and low-maintenance fabric, clear polycarbonate, corrugated steel and frame-only to allow you to choose the one that works for you. ClearSpan™ Giant Doors can be engineered to meet specific site requirements and are available from 24'W to 40'W. What fabric garage doors does TekSupply offer? TekSupply manufactures Fabric Gathering Doors in a wide array of sizes for a low-cost alternative to traditional garage doors. Manufactured from heavy-duty 22 oz. PVC-coated woven vinyl, these doors are flame resistant and have a temperature range of -22°F to 158°F. These doors are easy to install and can be mounted inside or outside of the structure. These doors can also be used to create room dividers inside a building. Fabric Gathering Doors require little to no maintenance and will not rust or rot. How do I know what size door I need? When purchasing a new garage door, making sure you get the appropriate size is crucial. There are certain measurements that need to be taken to ensure that the door will fit. First, the inside length of the previous door, if one exists, needs to be measured. Make sure to measure the widest area from one side of the door to the other. Repeat this process to measure the height of the door. Start at the highest possible point and measure to the bottom of the door. If there was no door previously, measure the opening that the door will need to fit in. Next, measure the space from the door frame to the end of the wall on each side of door or opening. The last important measurement is the headroom over the door. This can be crucial in deciding if a rolling door will fit in your space. Measure from the top of the door frame to the ceiling. Have questions about Poultry Supplies? Visit our Live Help page or Contact Us.